Halifax Water is proud to provide a gallery of maps, mapping applications, and relevant mapping resources for public access. Use these to learn more about our services, infrastructure, major projects and more. Halifax Water maintains approximately 8,350 public hydrants and 24,246 public catchbasins throughout the Halifax region. In an effort to better care for this critical infrastructure, Halifax Water has created a map marking the locations of hydrants. Bulk filling stations allow bulk water haulers to get potable water from the distribution system year round, 24 hours per day. The Lead Service Line Boundary map displays the geographical region in which lead service lines may have been installed in Halifax. The app allows users to search a civic address to determine if an address falls within or outside the boundary. Get a new, upgraded water meter free of charge! 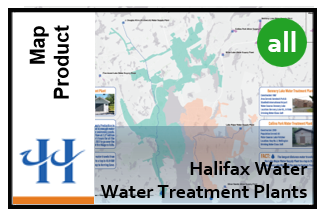 Use the map to see where Halifax Water is currently installing upgrades, where we are finished and where we are going next and book your appointment. Source water refers to the lakes, rivers, streams and groundwater where our drinking water comes from. Help us protect these areas by keeping them clean and untouched by avoiding these areas as much as possible. Is your property within the Halifax Water stormwater service boundary? Look it up by typing in your address, use your civic address or your Parcel ID. This boundary map is for the Halifax Water site related stormwater charge only. Where Does My Wastewater Go? Which of the seven wastewater treatment facilities handles your wastewater? Or is it one of the seven smaller treatment plants? Find out by typing in your address. With three large and six smaller water supply plants, do you know where your water comes from? Simply type in your address and find out. Fire hydrants and catchbasins are both critical pieces of infrastructure for the communities within the municipality. This map marks their locations with the hope they can be better cared for. Fun facts, figures, location information and process information for Halifax Water owned and operated Water Supply Plants. 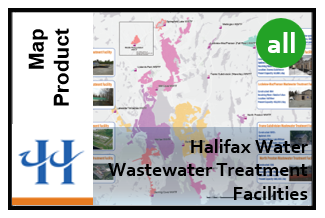 Fun facts, figures, location information and process information for Halifax Water owned and operated Wastewater Treatment Facilities. Capital projects identified by Halifax Water as potentially impacting customers during the construction phase have been included in this layer. The construction of these projects is planned to take place during the 2018-2019 fiscal year. Projects listed as being in the category 'Halifax Water/HRM - Joint' will be carried out in conjunction with Halifax Municipality activities to minimize disruption for residents. Layer is projected in WGS84 Web Mercator (Auxiliary Sphere). Halifax Water uses standardized representation to symbolize their distribution and collection systems. Reference this documentation for our GIS Legend. Halifax Water uses unique Feature Codes (FCodes) to catalogue their distribution and collection system GIS assets. Reference this document for our GIS FCode Table.